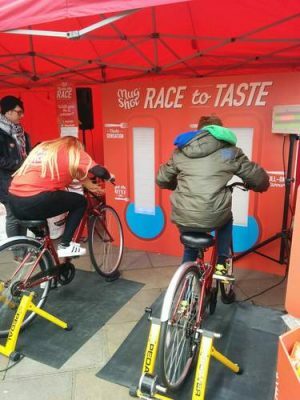 We were asked to provide bespoke pedal power activities for marketing company Creative Race as part of the Tour De Yorkshire. This was for Mugshots who are a sponsor of the race. 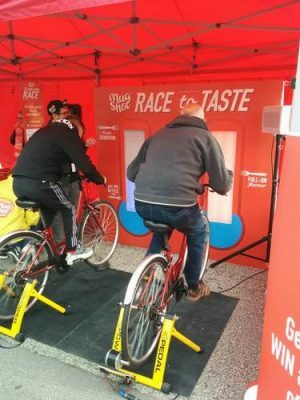 The client required an interactive promotional activity based around cycling. 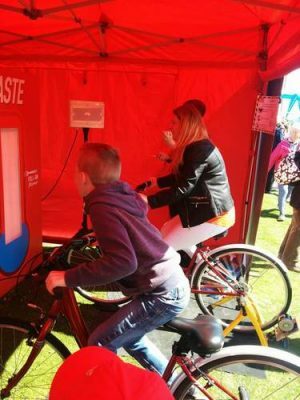 We provided a pedal power energy challenge where people raced against each other and against the clock to generate energy. This included two pedal generators and two large LED displays. The two competitors races against each other and filled up the LED bar graph displays. The first person to the top was the winner. The LED displays changed from blue to red to signify boiling of a kettle and a ‘Race to Taste’. We also provided a PA system and wireless microphone to do promotion, all of which was pedal powered. This display was used at the start point for each day of the Tour De Yorkshire in Bridlington, Tadcaster and Bradford.